Monday 26 September marked European Day of Languages, an initiative led by the Council of Europe to celebrate the rich diversity of languages across the world. To mark the day, Chetham’s Language Department took the lead in an interactive assembly exploring the languages already spoken in School. We call ourselves a truly international community, and nowhere is this made clearer than in the video created by the Language department for this assembly. 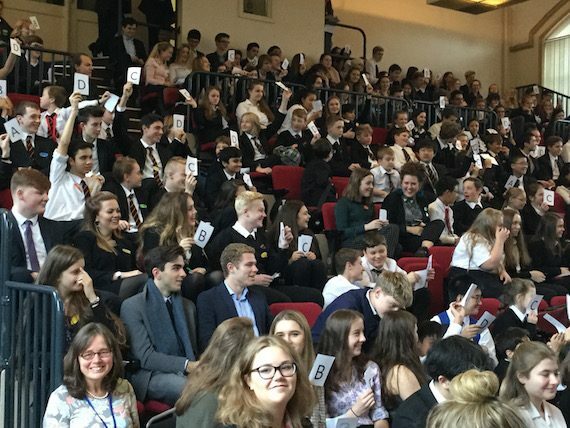 Here, 41 of our 300 students can be heard speaking 22 different languages, ranging from Greek to Bengali, Welsh to Mandarin; representing most, but not all, of those spoken as a first or second language across the School community. Students led their peers through a multiple choice languages quiz, and talked about the opportunities that language learning offers – from fun and friendship to travel and study. Three vocal students closed the assembly with performances of Rachmaninov’s Song of a Soldier’s Wife, Debussy’s Nuit d’Etoiles and Wolff’s Der Gärtner. We’d like to congratulate Frau Law and Madame Hales, who coordinated the assembly, and all of the students involved, including quizmasters Tammas Slater and George Herbert, singers Darya Birch, Jessica Harper and Katy Allan, and accompanists Heather Wang, Soli Nallaseth and Dr Nalimova. All students at Chetham’s are encouraged to study German and/or French up to GCSE level, since languages are of particular value to musicians. Conservatoires and music colleges in German speaking countries and in France offer very low fees to students, and these countries provide numerous and varied job opportunities for musicians. Foreign speakers are supported to gain qualifications in their native language alongside core GCSEs or A-levels. International students joining Chetham’s with English as a second language are given individual support to build their study and communication skills in English. Many students move on from the School to study and work internationally, with recent leavers’ destinations including the University of Cologne, the Buchmann-Meta School, Israel, and the Folkwang University of the Arts, Essen. Exchanges, performance and study visits to Iceland, Italy, Poland and Norway, Berlin and Paris provide regular opportunities for students to experience new cultures and communicate in a range of languages.